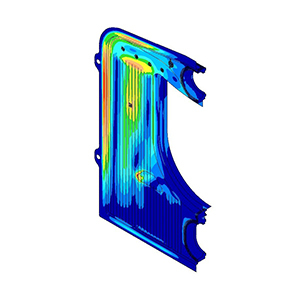 FEA-Solutions (UK) Ltd - Finite Element Analysis For Your Product Design | 497: Boiler for Industrial Heating Various sections of a modular industrial boiler have been analysed due to heat transfer, thermal expansion and internal pressure. The FEA replicated problems known from field trials. To investigate the effects of possible modifications, intensive CFD analyses have been performed subsequently.